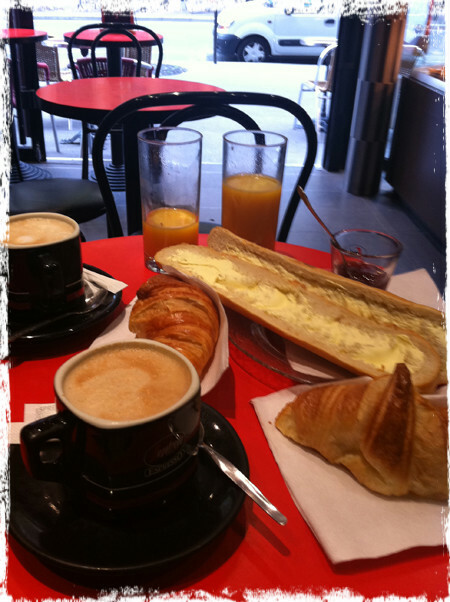 We took the long way to the market this morning and as we perused the various cafes Paalo's attention was caught by a sign offering Petit-Déjeuner Complet. "€5.80 for all that, it can't be" he exclaimed "you must have to choose." "Oh no, that's the price for all of it - you get coffee, orange juice, tartine and croissant, the only choice you need to make is what type of coffee you want." There might have been a slight tone of smugness in my voice - having indulged in a couple of breaksfast deals in my previous visit, but it was tempered by the fact that 6 years ago, I paid more! You might be thinking "oh those croissants are probably rubbish at that price" guess what, they aren't. I don't know where they buy them in from but they were incredible - served still warm, they had that magic combination of buttery lightness and fragility. The baguette was also very good, it was served buttered with a glass of strawberry jam. The cappuccino was also pretty good too - in fact we even ordered another to tide us over for the market visit.